Written by Neil Sneade on 5 Apr 2019 in Social. Last update on 9 Apr 2019. There’s no doubt that Cambridge South has come a long way over the past couple of decades, from a little village club with a couple of men’s and a single ladies’ side (as in, there was only one ladies’ team, rather than all the ladies’ in it were single. Although they could have been - our records don’t indicate one way or the other). As the number of club sides reached double digits and attendance at the end of season dinner triple digits, it seemed it might be a good time to introduce an occasion aimed at the more long standing members of the club. Those stalwarts who have served faithfully with stick or pad for many a season. Who can find their way to Wisbech without need of satellite navigation. Who may still have an old green or blue shirt buried at the bottom of a drawer. We needed something to celebrate this worthy cohort: we needed a commemorative dinner. And a tie, we needed a special tie too. So it was that, just as the annual dinner signals the close of each season, the start of the season was marked by the first Centurions’ Dinner, for players who have achieved the mark of one hundred appearances for the club, organised by club secretary, Neil Sneade. 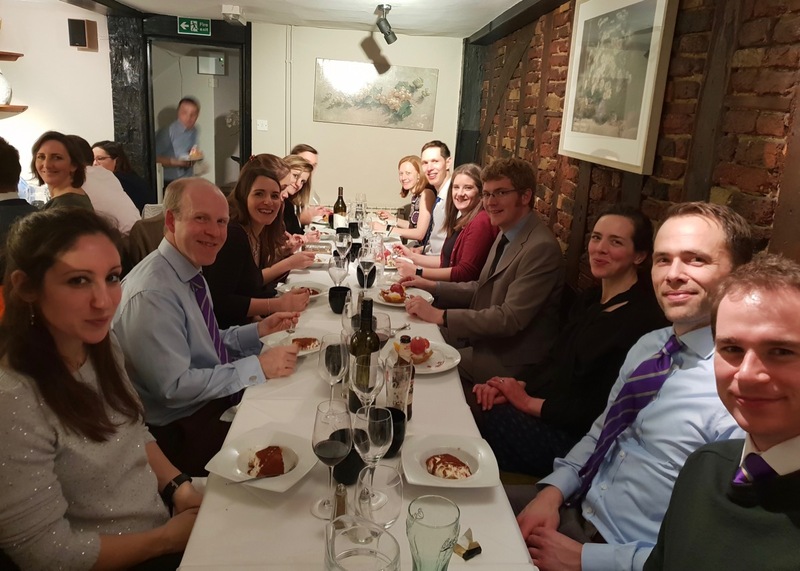 Envisaged as a smaller and less formal event compared to the annual dinner, twenty-eight current and former Southerners and their guests gathered for a private dinner at the St John’s Chop House, some after a snifter across the road at the Punter. The number of appearances ranged from exactly one hundred for Hannah, who had specifically arranged an extra friendly game - an additional game rather than one that was especially friendly. Although again, it might have been; I wasn’t there - to reach the mark that would get her an invitation to well over three hundred for club chairman, John Greaves. Of course the careers of quite a number of those present dated back to the Time Before Records Began so it’s certain that many sported more caps than officially declared. Nevertheless, the known appearances assembled for the evening still totalled over four thousand! 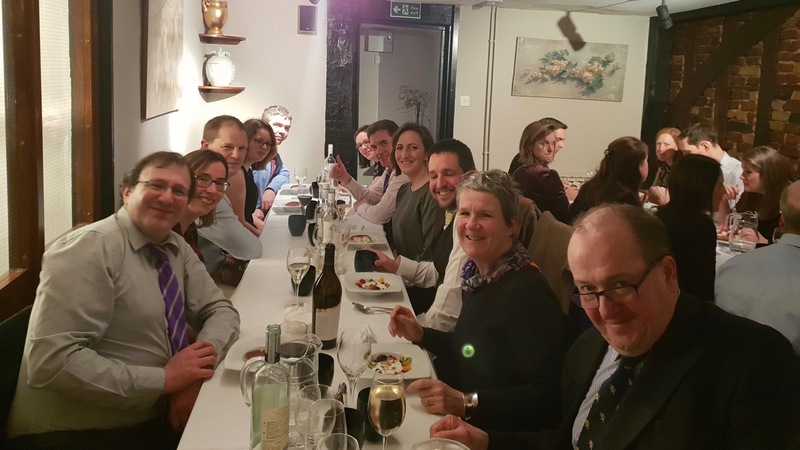 The event proved to be a very convivial occasion, with many players debuting their new centurions’ club tie - now we had a dinner to wear it at, it finally made sense to have one. Terrines were consumed, steaks polished off, Eton messes cleared, and Simon Cooper and Tom Anns stoically worked their way through their litres of house red without too much incident. By the end of the evening, the consensus was that it had been a great success, and something worth making into a regular event. Replete, sated and with our fondness for the great institution of Cambridge South renewed after an evening of nostalgic reminiscences, we tottered off into the warm September evening. Now that we had a club dinner at the start of the season and at the end of the season, there seemed an obvious space still to be filled. 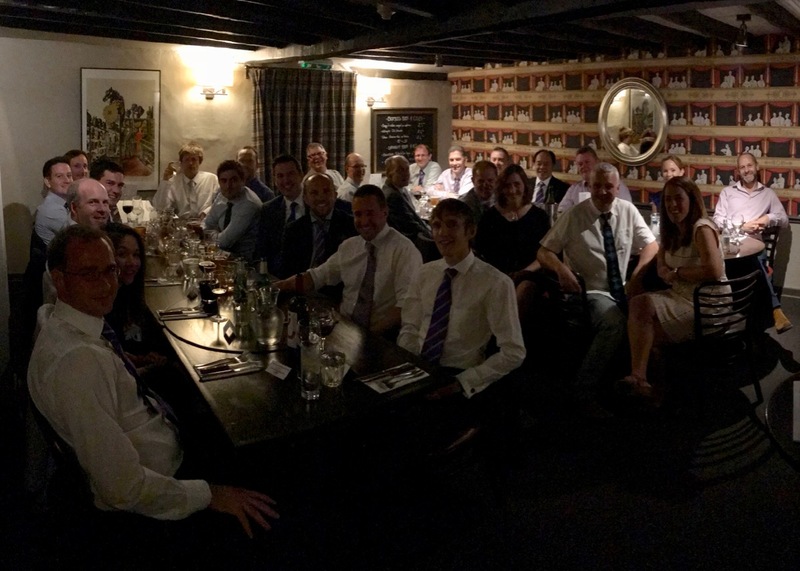 Never one to let an opportunity go to waste, the mid-season void was filled by Neil with another new occasion: the President’s Dinner, this time for members past and present who had served the club as captains or officers. Of course, this had a significant overlap with the one hundred appearance group but some seemed very happy for the opportunity of a second club dinner (and chance to wear their new tie) during the season, and we were also glad to welcome many others too, particularly from the ladies’ side of the club. Indeed, there were no fewer than six former Ladies’ 1st XI captains present! The President’s Dinner was held in January at the La Margherita restaurant, entirely coincidentally again just a couple of hundred yards from the organiser’s house. Some had travelled considerably further to be there, people making the trip from as far afield as Somerset and even Denmark. The only thing noticeably lacking was a President, previous incumbent Steve Fleck having stepped down a decade ago, and we’d somehow never got around to choosing another. It didn’t seem to detract from the occasion though, but it did stimulate discussion around suitable candidates who could be appointed before next season’s event. Having enjoyed another pleasant evening of good food, good wine and good company, hopefully the Centurions’ and President’s Dinners can become regular fixtures in the club’s social calendar, recognising the long service and contributions given to the club by many over the years.